Our Land and Building personnel diligently care for the campus property and initiate seasonal projects to beautify the land. 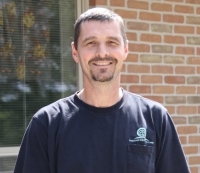 Cris Ritsema, born and raised in Grand Rapids, MI, worked for the Bouma Corporation for over twenty years and graduated from Michigan State University’s Landscape and Nursery Program. Cris began his association with the Sisters through the community workdays. In 2005 started in the site manager position at the Center. Because of his training at MSU and his background in construction, Cris creates beautiful landscapes with special features like our new waterfall. In addition, he is an excellent leader and manager of the many work groups and volunteers that come to the Center. Barb Ritsema learned about the Center when she sent her children here for preschool in the 1990’s. 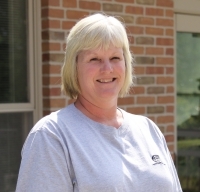 After working in a variety of roles in the service industry, she was hired as support staff in 2007 to help with the management of the land, and the maintenance of our meeting facilities and overnight accommodations. Barb creates an environment that is both welcoming and professional. Her work on the indoor space of the Center makes visitors and guests feel at home.